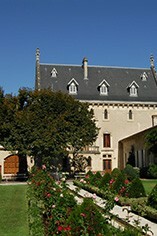 Château La Gaffelière is owned by Léo de Malet Roquefort, and the 22 hectare property produces on average 10,000 cases per year. Located in the centre of the St. Emilion appellation, due south of St. Emilion town, the property shares a similar climate to that enjoyed by both St.Emilion and Pomerol: more continental than the maritime Médoc, with generally more spring rainfall, though less in summer and winter. La Gaffeliere's vineyards (Cabernet Sauvignon 5%, Merlot 65%, Cabernet Franc 30%) lie on a sloped sandy/clay-limestone topsoil and limestone subsoil (a mix of Côtes and Pieds de Côtes). Fermentation takes place in stainless steel followed by extended wood maturation, with 33% of the barells being renewed annually. La Gaffeliere is classified as a 1er grand cru classé(B).